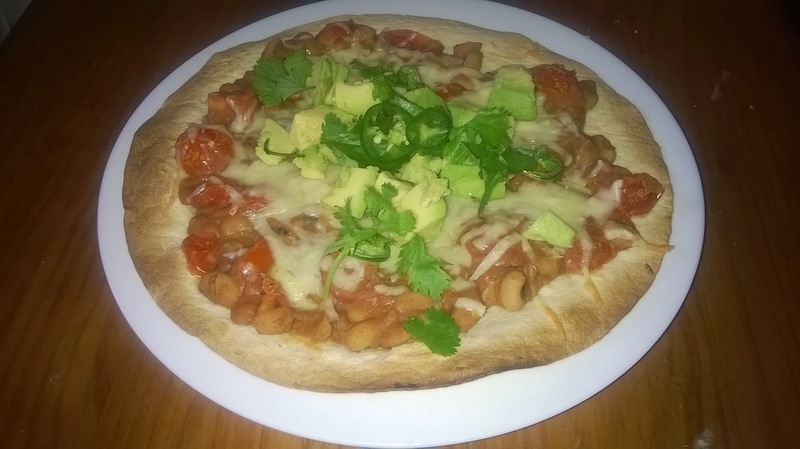 Ever fancy a pizza but would prefer a healthier version? Then look no further! These little Mexican treats have everything good about a pizza – a crunchy base and a cheesy topping (with the added bonus of a zingy Mexican taste!) – with far fewer calories. This is full of deep, smoky flavours which – despite being vegetarian – will fool even the most avid meat eaters. You’ll be happy to hear that this recipe takes just 15 minutes to make. The amount below will serve 2 – but is easily doubled or tripled. 1. Put the oven on a high heat. Put your tortillas on a baking tray and pop in the oven for 1-2 minutes, until starting to crisp but not coloured. Remove from the oven and leave to one side. Keep the oven on. 2. In a saucepan, mix together the refried beans, black-eyed beans, quartered cherry tomatoes, cayenne pepper and smoked paprika. Cook on a medium heat for 2 minutes until heated through. 3. Put your tortillas on two baking trays (if you have two shelves in your oven – otherwise cook them one at a time, they don’t take long). 4. Add half of the bean mixture to each tortilla and smooth – like you would a tomato sauce base on a pizza. Add half of the grated cheese to each, then slice the chilli and sprinkle evenly over. 5. Put in the oven for 5 minutes, until the tortilla edges are browning and the cheese is melted. 6. Chop the avocado and add half to the top of each tostado, followed by a few leaves of coriander. You’ll love them!